Sears is at risk of defaulting on its debt according to credit rating agency Standard & Poors. And that sent its already battered stock to record lows Friday. S&P downgraded Sears Holdings (SHLD) late Wednesday to the lowest rung of junk bond status. Sears is trying to get some lenders to accept late payments on $1.3 billion of its debt, and S&P warned that if lenders agree it expects to downgrade the retailer further to "SD," which stands for "selective default." The company owed a total of $4.4 billion as of Oct. 28, the most recent figure it has disclosed, so it's trying to delay payments on roughly 30% of its overall borrowing. Shares of Sears plunged 11% in trading Thursday to a record low following that downgrade. And they slid another 9% in Friday. Friday marked the fifth time in the last four weeks that the stock has hit a record low. It has already lost 29% of its value so far this year after a 61% plunge in 2017. Sears would not comment on S&P's latest ratings action. But it said it has taken actions to strengthen its financial position, including paying nearly $325 million of a term loan, leaving an outstanding balance of about $400 million. "We remain intensely focused on becoming a more competitive retailer," said the company's statement. "With the support of our associates, vendors, investors and other key stakeholders, we expect that the actions we are taking will support these efforts." Sears announced earlier this month that it's trying to refinance some of its debt and cut other costs as it struggles with a turnaround plan and a sharp drop in sales during the holiday shopping season. It also announced plans to close 39 more Sears stores, along with 64 Kmart stores. 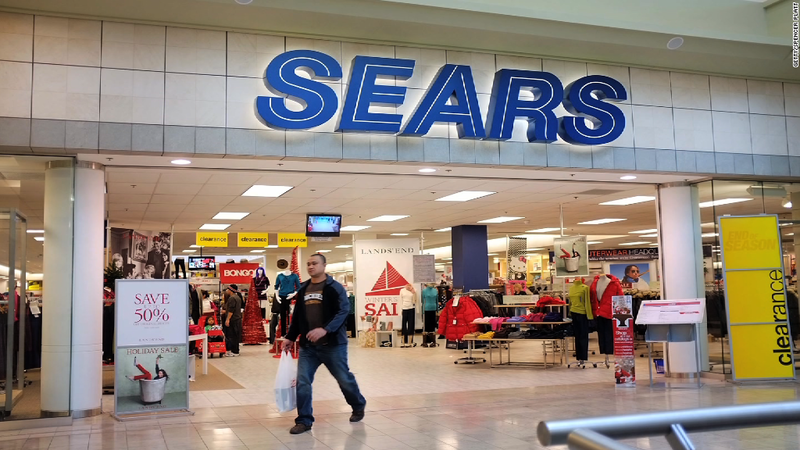 Even if Sears does default, that doesn't necessarily mean that the company will file bankruptcy, said Robert Schulz, S&P's chief credit analyst for the retail sector. "They still have assets they can sell. It's not clear that Sears' strategy is to file for chapter 11," he said. But it is a further sign that Sears is struggling to survive with its current debt load. If the retailer goes into "selective default," that would raise additional concerns among other lenders, as well as its vendors. In March of last year it warned that ongoing losses meant there was "substantial doubt" about its ability to say in business. Worried vendors pose a competitive problem for Sears, because many are asking the retailer to pay for goods up front. Retailers typically have a chance to sell the goods before they have to pay their vendors. But the vendors that work with Sears worry that if the company files for bankruptcy, they might not get the money they are owed. Some vendors, including Whirlpool appliances, have stopped selling their goods in Sears. Whirlpool (WHR) ended a century-long relationship with Sears in October. But Sears doesn't have much choice but to try to delay its debt payments. It warned on Jan. 10 that if it can't restructure its debt, the company's board "will consider all other options to maximize the value of its assets."